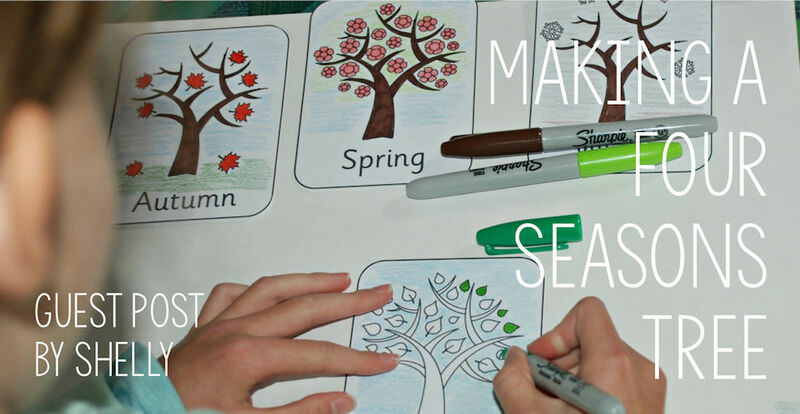 We have made our four season trees a number of times and it is such a fun and easy season craft so I thought I would share what we do. The key is to have four trees of the same size. We have used the trees from the four season colouring page. In both cases we found it better to print the trees onto card or thicker crafting paper. You could keep this as a straight forward colouring activity. Then we collaged our trees with tissue paper and some wool. I loved the end results and think you could display the trees like they are as stunning pictures. Or you could glue then together. We did this by folding each page in half and then gluing the last half of the first tree to the first half of the second tree – have a look at the video clip to see what we did. And here's a picture of our completed four seasons tree activity, standing up on display! This is a guest post from Shelly. Shelly is a home educating parent of two children aged 6 and 9. She blogs at ofamily learning together where she shares ideas on the different learning activities that they do including lots of hand-on Maths, arts and crafts and anything else that is part of their home educating lifestyle. You can find more guest posts by Shelly, and a list of all our guest posts, here. This lovely poster shows clearly the four different seasons, with a tree changing with the seasons. You could also cut the individual pictures out to make four cards.